This script displays a palette with controls for identifying the location of keyframes on a layer by using layer markers. Allows you to copy one or more markers and paste them on any other layer. After Effects does not allow copy/pasting markers in their UI, so this script is here to help. Batch edit all layer marker attributes on selected layers. Also has an option to export the marker to a text file. This script provides methods to shift, sequence, stagger, or randomize layers properties like in and out points, keyframes, markers and more, presented in a compact UI. Скрипт для другой цели (аналог Trigger Работа с курсором мыши и кнопками в After Effects через маркеры (выражения) +проект), но может удалять, копировать, сдвигать маркеры слоя. 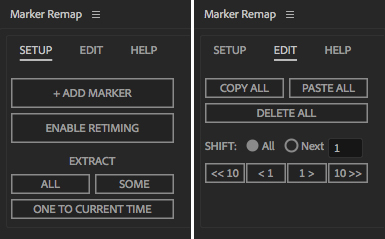 Marker Remap let’s you retime compositions using layer markers in two easy steps!